Hi there! Let me show you another mani I did not too long ago! 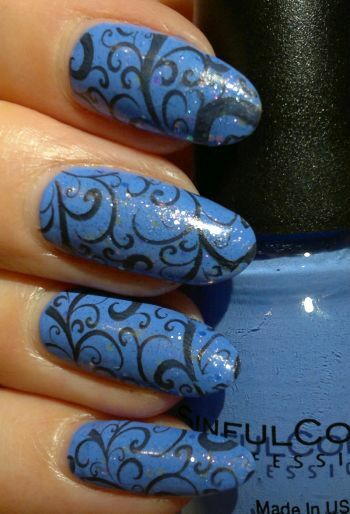 For this mani I painted my nails with Sinful Colors Blue La La (2 coats). I really love this polish. The formula is great, the polish dries quickly, and the colour is stunning! And then I stamped! I used Pueen‘s 74 plate (which is part of Pueen‘s Buffet Leisure collection) and a home-made black polish. I didn’t love this mani, but I think it looked alright. Do you like blue nails? What colour are your nails right now? Feel free to comment. And thanks for reading! Hi there! Today’s Nail Of The Day post is about a mani I did last month. For this mani I painted my nails with my home-made white polish. I opted for a white base because I wanted to finish a near-empty colour polish. And stamping is simply the easiest way to get those hard to reach last drops of polish out of the bottle. The colour polish I stamped with is Bourjois Sunset A Rio 47. The stamping plate I chose is Pueen‘s 77 plate (part of Pueen’s Buffet Leisure collection). The coral polish was paler than expected, so I double-stamped. This seemed to mess up the images, but I was OK with that because I managed to empty the Bourjois polish! Success! Hi there! Today’s Nail Of The Day post is about a mani I did recently. For this mani I painted my nails with Bourjois Anti Choc / No Chips 17 and Astor Lacque Deluxe 875 Electric Blue. And I used colourful water decals to add that je ne sais quoi to an otherwise fairly standard mani. 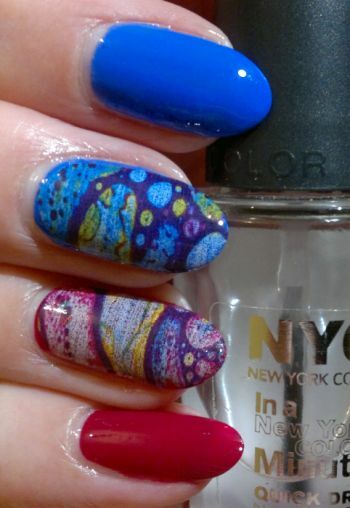 Since the water decals are quite eye-catching, this mani is going in the A-Z Nail Art Challenge folder. I’ll file it under V – Vibrant Nails. Hi there! After yesterday’s Battle Of The Base Coats I’ve got a regular Nail Of The Day post for you today. 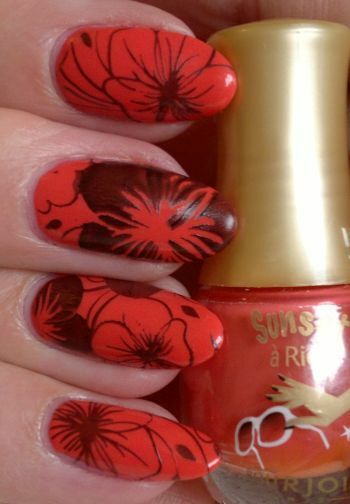 For this mani I painted my nails with Bourjois Sunset A Rio 47 (2 coats). This polish is amazing. It goes on like a dream, it dries quickly, and it’s opaque in 2 easy coats! The stamping plate I used is Pueen’s 72 plate (which is part of Pueen’s Stamping Buffet collection). The black polish I stamped with is Rimmel 60 Seconds 820 Hot Black To Go. I’m happy with this mani. I know the image on the middle finger doesn’t look perfect, but this is an issue with the plate, and there’s nothing I can do about it. In any event, I like this mani a lot! Do you agree? Feel free to get in touch via the comments. And thanks for reading! Hi there! I’m continuing with the 31 Days Nail Art Challenge, and I’m also doing Christmas manis this month. And today’s nail art challenge is #17 Glitter! 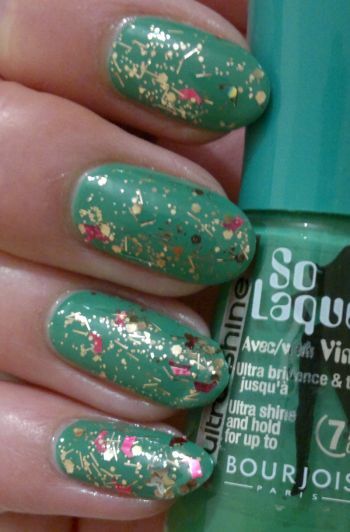 For this easy mani I painted my nails with Bourjois So Lacque 61 Vert Chlorophylle (2 coats). I really like this polish – it dries reasonably quickly and the formula is easy to work with. The glitter polish is one that sat in my stash for quite some time. It’s Barry M Jingle Bells, a cute gold and red limited edition glitter topper from 2014. How do you like this mani? Feel free to let me know. And thanks for reading! Hi there! Since it’s nail week, here’s another recent mani. When I started to paint my nails, I thought I was working on a masterpiece of a mani. 😀 However, it didn’t turn out to be great. Bourjois So Lacque 39 Jaune Trendy (index finger, thumb). I thought it would be nice to stamp and to add some glitter. 🙂 The green glitter on my pinky is Maybelline Color Show 425 Lady Liberty, a low quality topper with nowhere near enough glitter in it. 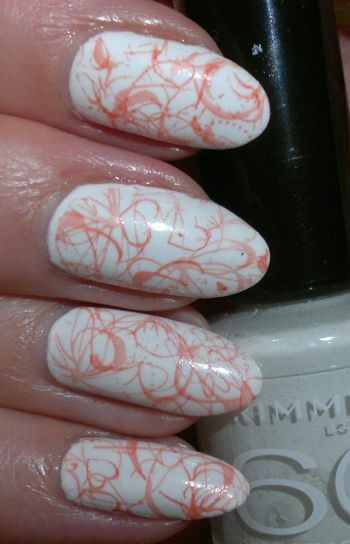 Then I used my trusted white stamping polish (Essence!) to stamp images onto the thumb, ring and index fingers. Unfortunately the light green Manhattan polish was too light, so the white hardly showed. Then I tried to stamp a different image onto my middle finger. I used Rimmel 60 Seconds 846 Jungle Fever. This polish didn’t stamp very well. I made several attempts to make it work, but in the end I gave up and I settled for an incomplete image. All in all this mani was a fail. Hi there! Today’s post is another nail post. I don’t wear yellow nail polish very often. But I’ve got dozens of yellow polishes. And since it’s still summer, I thought now’s the time for a yellow mani. You may notice that my nails are considerably shorter than last week. Nope, no nail accident this time. (Yay!) They just got too long so I filed them down again. Now back to the mani! 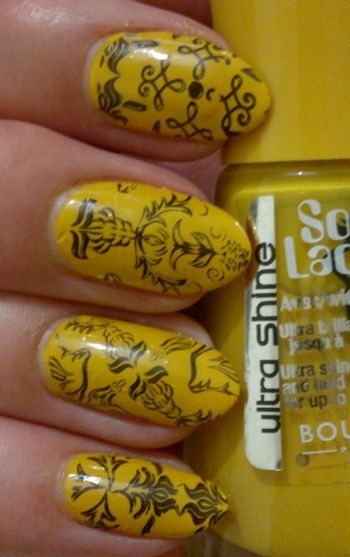 I painted my nails with Bourjois So Lacque 39 Jaune Trendy (two coats). The stamping plate I chose was JQ-L02. 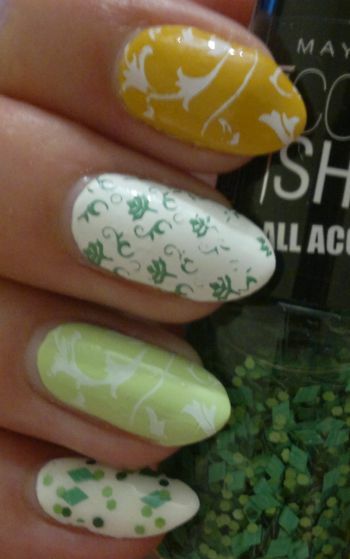 This is one of my stamping plates that feature smaller (but beautiful!) images only – so I can only use these plates when my nails are relatively short. I don’t remember which black polish I used to stamp on the images. And I also don’t remember how I managed to put a dent in the middle finger, but in real life it was barely noticeable.